The Daily Dimwit: A Couple of Recent Pick-Ups! A Couple of Recent Pick-Ups! 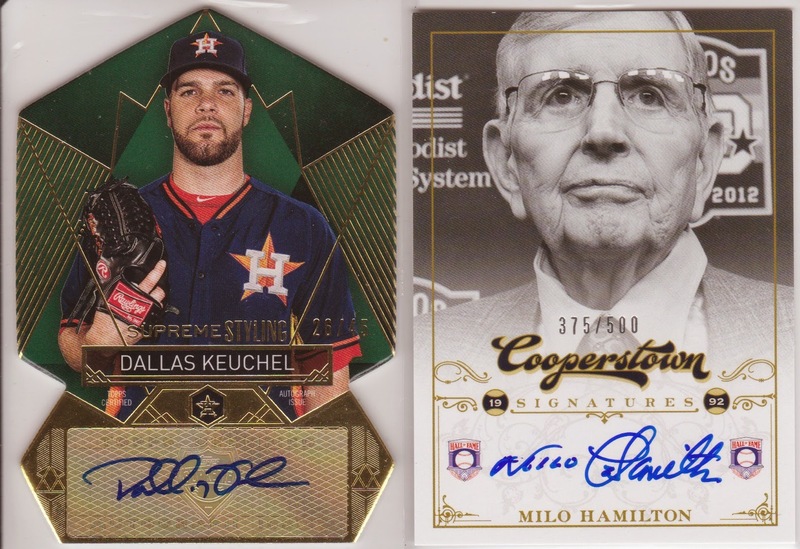 Dallas finally got some autos and such from Topps Supreme this year, great for the guy who secured the AL Golden Glove! This is a SWEEEEEEET Die Cut auto numbered out of just 45! How about that Milo Hamilton auto? Milo called Astros games for as long as I remember listening to them on the radio and am glad to pick up a certified auto of his! I have a TTM-type auto in the collection but this is a nice add and numbered out of /800. Can I start sending you Astros again?? I liked Milo when he was with the Cubs. Interesting signature, printed first name, cursive last. Age? Next Five Hits From My Blaster Case!